The SpaceLiner, which is being developed by the Institute of Space Systems at the German Aerospace Center, could allow passengers to board in Europe, sit back, and disembark 90 minutes later on the other side of the world, in Australia. A hypersonic "SpaceLiner" would whisk up to 50 passengers from Europe to Australia in 90 minutes. The futuristic vehicle would do so by riding a rocket into Earth's upper atmosphere, reaching 24 times the speed of sound before gliding in for a landing. Many challenges still remain, including finding the right shape for the vehicle, said Martin Sippel, project coordinator for SpaceLiner at the German Aerospace Center. But he suggested the project could make enough progress to begin attracting private funding in another 10 years and aim for full operations by 2050. The current concept includes a rocket booster stage for launch and a separate orbiter stage to carry passengers halfway around the world without ever making it to space. Flight times between the U.S. and Europe could fall to just over an hour if the SpaceLiner takes off — that is, if passengers don't mind paying the equivalent of space tourism prices around several hundred thousand dollars. "Maybe we can best characterize the SpaceLiner by saying it's a kind of second-generation space shuttle, but with a completely different task," Sippel said. SpaceLiner passengers would have eight minutes to experience the rocket launch before they reached an altitude of about 47 to 50 miles (75 to 80 kilometers). That falls short of the 62-mile (100-km) boundary considered the edge of space, but even a suborbital flight would allow SpaceLiner to glide back to Earth at hypersonic speeds of more than 15,000 mph (25,200 kph). 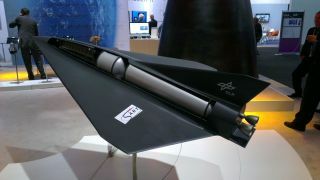 The rocket-powered design stands out compared with other proposed hypersonic jets, which feature new air-breathing engine concepts. European aerospace giant EADS previously unveiled a hypersonic jet concept that would rely mainly upon air-breathing ramjets to reach cruising speeds of Mach 4 — faster than the supersonic Concorde's Mach 2 performances but far slower than the SpaceLiner's Mach 24 goal. "We will not try to improve the performance of the engine but would like to have it more reusable," Sippel told TechNewsDaily. The empty rocket stage from SpaceLiner would return to Earth immediately after launch in preparation for reuse. An aircraft could grab the rocket stage in midair, tow it toward an airfield and release it for an autonomous gliding landing. But big challenges remain before SpaceLiner can take off. Researchers first must finalize a design shape capable of surviving the intense heat created by gliding at hypersonic speeds through the upper atmosphere. New cooling technologies and improved heat shielding for SpaceLiner's wing "leading edge" could help in that case. Launching like a rocket rather than taking off like an aircraft means SpaceLiner would remain restricted to suitable launch sites with uninhabited areas down range. The SpaceLiner also would need a careful flight path during its final landing approach — the "sonic boom" shock that accompanies aircraft traveling faster than the speed of sound can damage buildings on the ground at low altitudes. "The profile of the vehicle is very similar to a rocket-propelled vehicle," Sippel explained. "We only have a small corridor in which we can fly safely and economically." SpaceLiner's design will make use of study results from a FAST20XX (Future High-Altitude High-Speed Transport 20XX) project funded by the European Union and backed by researchers from Germany, Austria, Spain, Switzerland, Italy, Belgium, the Netherlands, France and Sweden. It can also draw lessons from upcoming efforts such as Project ALPHA by Aerospace Innovation GmbH — a space plane that aims to launch in midair from an Airbus A330 aircraft. But future success ultimately depends upon the success of space tourism efforts by companies such as Virgin Galactic. If enough people prove willing to pay top dollar for suborbital flights as part of their travels around the world, Sippel envisions a fleet of SpaceLiners eventually making 10 to 15 flights per day. This story was provided by TechNewsDaily, sister site to SPACE.com. You can follow TechNewsDaily Senior Writer Jeremy Hsu on Twitter @jeremyhsu. Follow TechNewsDaily on Twitter @TechNewsDaily. We're also on Facebook & Google+.